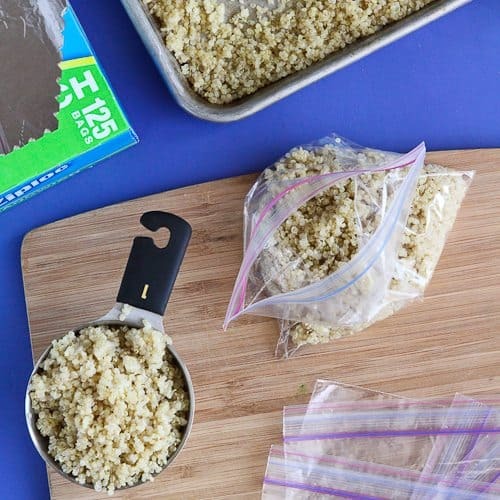 This tutorial on How to Freeze Quinoa will change your cooking life! Stock up your freezer with this versatile grain so you can have it on hand for quick salad, soups & side dishes. Quinoa. It’s everywhere – in salads, in stews, even in meatballs. 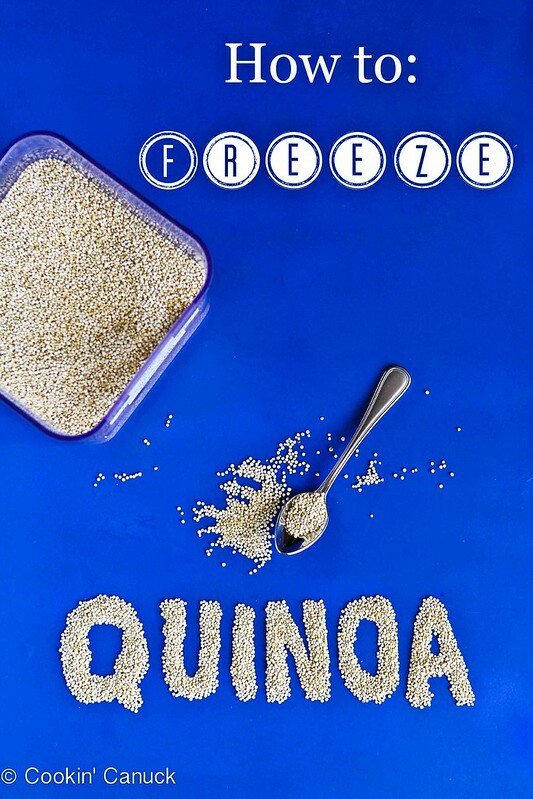 But did you know that you can freeze quinoa? The next time you whip up a pot of the healthy grain, use this tutorial on how to freeze quinoa, go a little overboard and make a triple, or even a quadruple, batch. Defrost it in the microwave and use it however you please. Easy as pie…well, or quinoa. And since you’re freezing, be sure to cook extra! In a medium to large saucepan (depending on how much quinoa you’re cooking), combine one part quinoa with two parts water. 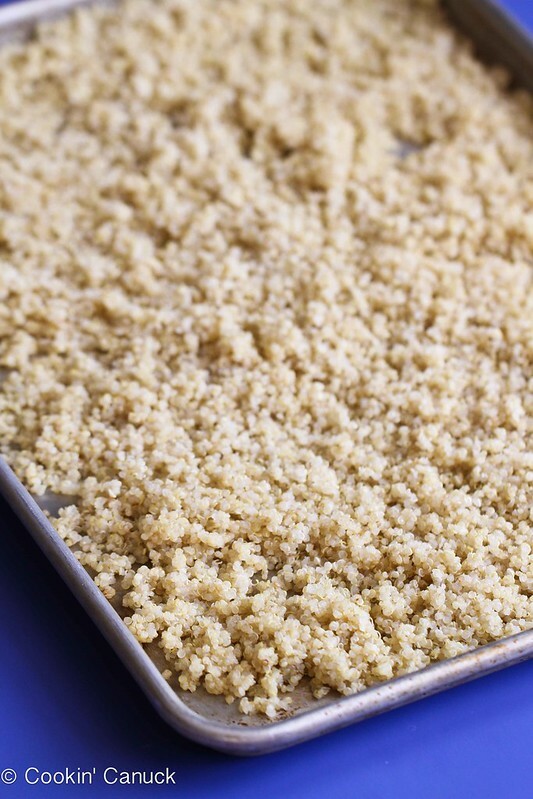 Transfer the cooked quinoa to a large baking sheet (or two) and spread the cooked grain out evenly. Let it cool to room temperature. 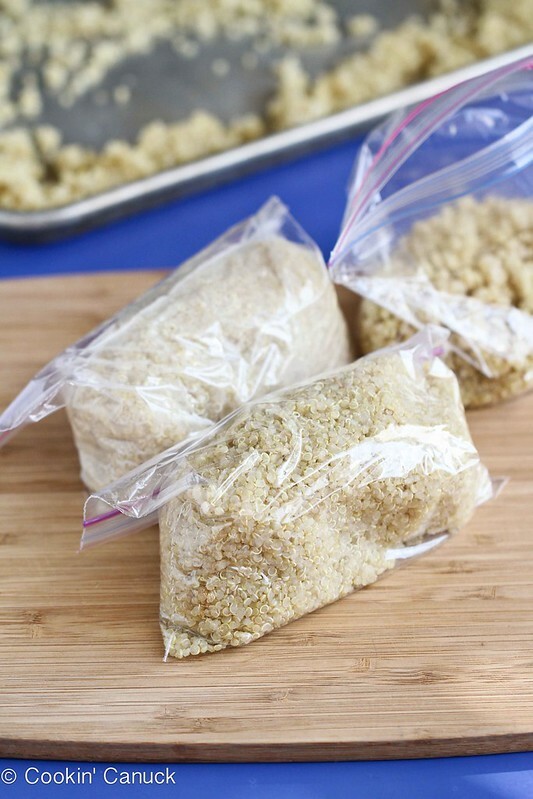 Measure the quinoa into the desired amounts and scoop into resealable plastic bags. I typically use the sandwich-sized Ziploc bags, which hold 2 cups of cooked quinoa. Squeeze all of the air out of the bags and seal them. Place the small Ziploc bags into larger freezer-proof Ziploc bags. 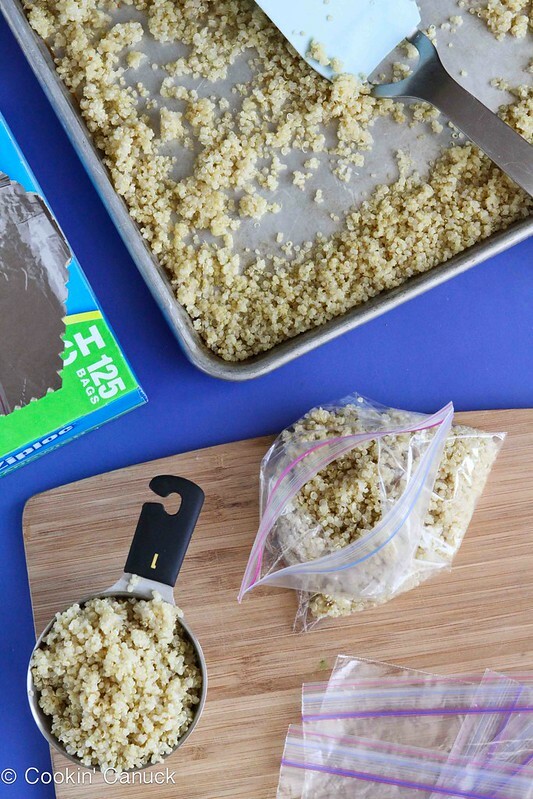 Take one or more bags out of the freezer and allow the quinoa to defrost at room temperature. Alternatively, dump the quinoa into a bowl (you may have to cut the Ziploc bag open with scissors to get the quinoa out) and cook it in the microwave for one minute. You’re ready to go! *The ratio of water to quinoa is 2 to 1. In a medium to large saucepan (depending on how much quinoa you’re cooking), combine one part quinoa with two parts water. To defrost, take one or more bags out of the freezer and allow the quinoa to defrost at room temperature. Alternatively, dump the quinoa into a bowl (you may have to cut the Ziploc bag open with scissors to get the quinoa out) and cook it in the microwave for one minute. Why haven’t I ever thought to freeze quinoa? Brilliant! It was a revelation for me, too. It makes quick dinners that much easier. You’re going to laugh when you see my post Wednesday. It’s not freezing quinoa but it’s similar. 🙂 This is a great tip!! I honestly don’t freeze quinoa and I should!! I always look forward to seeing your posts, Liz! Love this, Dara! I just ordered a big bag of quinoa last week…I’m almost out. I love the idea of freezing it! Cassie, I wish I had known about this years ago. Now there will be no stopping me! Thank you so much for this! I just bought quinoa for the first time and I wasn’t entirely sure what to do with it. Great ideas, and now I know I can just cook the entire bag and freeze it. Such a genius idea Dara! I’m new to the quinoa scene but now that I know I can freeze it… I’ll be turning out quinoa left and right! You’re going to love quinoa, Laurie. It’s such a versatile little grain. I don’t cook with quinoa nearly enough. But I did just post a recipe last Friday – perfect timing!! And I can imagine I’d eat a lot more if it was already prepared – love this! I loved that recipe of yours, Deb. Thanks for linking it up! It’s popular in our house, too, and that makes me very, very happy. Perfect! I can’t wait to see what you share, Rachel. I like to add it to scrambled eggs with spinach & other veggies….so have been freezing quinoa to decrease prep time. It is so handy to have it pre-prepared in the freezer! What a great idea to add it to scrambled eggs. I’ll have to try that next time. 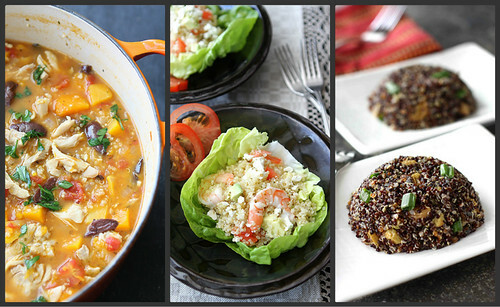 love quinoa and am so excited for this round-up! Me too, Elizabeth. It’s always fun to see what people share. 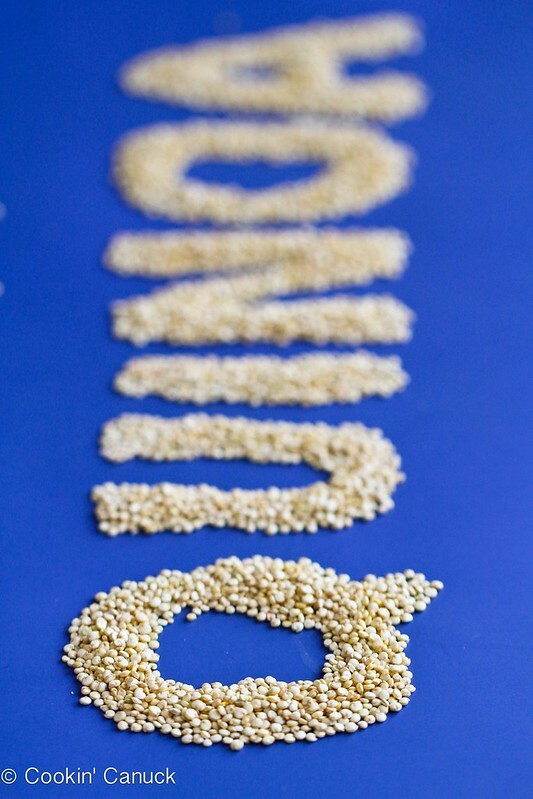 How long did it take you to spell out quinoa? 😉 Great tip on freezing! Genius idea Dara! I’m sad I don’t have a link up to offer, boo hoo! Gotta get me some quinoa! I’ve shared this link with my friend Jenny who is the Queen of Quinoa. I still think they look like unfurled prophylactics when cooked and I’ll choose a different grain to try out the recipes. Wow. 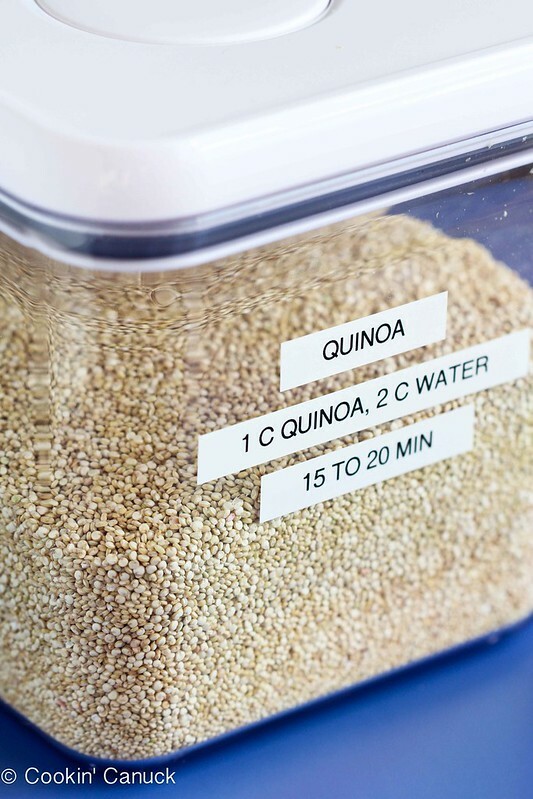 SUCH a great idea – it is a bit of a pain to make – so this will encourage me to eat more quinoa. Brilliant photos/graphics, too! Dara, I just got some new quinoa and will do this tomorrow with my brown rice! I am SO excited try these amazing recipes – what a resource! I admit to being a little under-creative with what to do with quinoa but no more. Thanks! Great idea Dara. Thought I would pass a tip on to you. This is how I freeze everything, soups, rice, etc! Then I have a basket in my freezer that they fit in perfectly standing up! Such a good idea! How long does quinoa last in the freezer? This is kind of a clean out your fridge type recipe – measures are very approximate. Add more or less to your taste and omit or add as you see fit. Any mixed cooked veg you have on hand chopped, roasted red peppers from a jar are good too. Mix it all together in a bowl until it holds together. Make golf ball sized patties and flatten. Fry in a pan with a bit of oil until cripy and brown on both sides. Serve warm with a salad or cool and freeze for another lunch. Thaw on counter for a couple of hours or microwave to use. Options: add curry spice, rasins, chopped olives, green chilies, garlic, herbs etc to make it to your own taste. I also sometimes use italian salad dressing in blace of the pesto. Yum! Got to try this right away. Extra quinoa just waiting in the fridge. I just read that quinoa is freezable in one of my food mags this month. Thanks for the reminder. 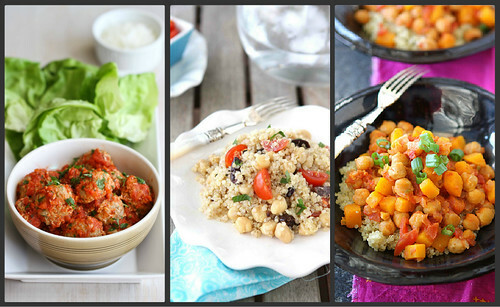 This will make healthy weekday meals so much easier! This is such a great idea. A perfect way to encourage me to use more quinoa. Such a great idea Dara! BETTER WAY TO FREEZE almost anything is to add one step: Instead of “squeezing all the air out” on your counter, which is physically and scientifically impossible, squeeze MORE air out by closing the ziploc almost all the way, leaving a small opening vent. Immerse the bag slowly into a large bowl filled with water until most of the air has escaped the ziploc. Ensure the ziploc is squeezed from one end to the other while the bag is under the water (I get all the way to the zipper). When you lift the bag out of the water you will see what I mean: You will have much less freezer burn, things will last a little longer in the freezer. beach volleyball, or simply relaxing in a hammock under the huge palm trees shade. able to host more and larger luxury liners. I blog frequently and I genmuinely thank you for your content.
) , and home-roasted or steamed vegetables (from the freezer), microwave more if needed for heat. This site keeps altering what I’ve typed and will NOT let me correct or retract the entries. I’m sorry that you’re having difficulties with commenting. I did receive your previous comment, with quinoa ideas. Thank you for sharing those! I found your web site when I cooked quinoa for the first time and underestimated how much it makes. (Picture Ricky and Fred cooking quinoa instead of rice.) I am relieved that cooked quinoa can be frozen and look forward to trying your recipes! You are brilliant and I really look forward to seeing and making your recipes. Thanks again. Dara, have you tried to freeze cooked spaghetti squash?